Husband & Wife, addicted to target trips, believers, probably drinking coffee, natural light lovers, and proud puppy parents. Wow. What a beyond lucky photographer I am, blessed beyond measure honestly. I don’t know what we did in life to deserve such amazingly kind and wonderful people as clients, but all I can say is WOW! This season of life has been busy, wedding after wedding for the past few weekends now for us. In seasons like this it can be so easy to get overwhelmed and feel over-worked, but when you have THE BEST clients in the world…well, let’s just say that’s basically impossible! Gabby & Kevin have been so amazing to work with and to get to know, we have loved being a part of this season of life for them! I say it time and time again, although I am a photographer I know that pictures aren’t my sole purpose in life. I adore being a photographer and I love capturing gorgeous, dreamy portraits…however, I will ALWAYS believe in people over pictures. Always. If at the end of the day, I don’t feel good about my relationship with our brides and couples, than that’s not okay with me. The same goes for how our brides and couples feel about us as well. Because we believe in people over pictures, it’s important to us to have our couples ENJOY working with us, actually to have FUN when working with us, and to trust us whole0heartedly too! And well, working with Gabby & Kevin has been just that…and plus some!! 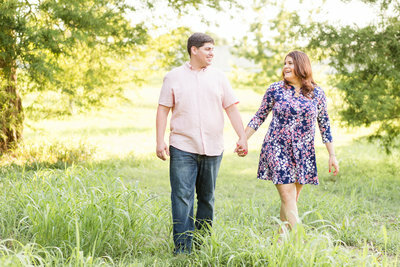 Daniel & I have loved working with Gabby & Kevin since we met them for their initial consult with us! Kevin is actually a triplet with Kelly who I went to high school with! It has been so much fun getting to reconnect with her over the past few months too! From minute one of working with these two, they have been AMAZING to work with! As a photographer the biggest compliment we could ever receive is trust from our clients, i’m serious! With Gabby & Kevin, there was an unwavering level of trust they had in us! 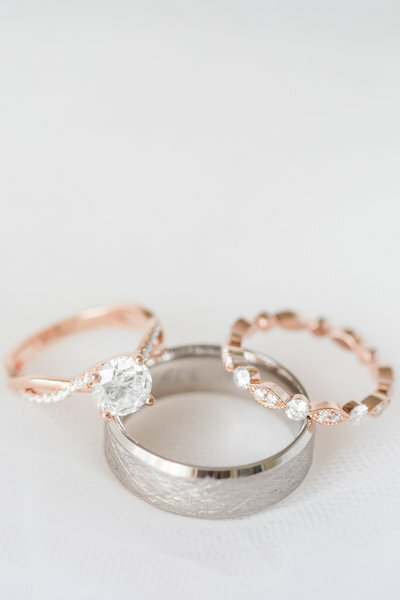 From locations for engagement and bridal portrait sessions, to timeline recommendations, and they even changed their mind about a first look too! Initially they were not interested in sharing a first look, which was totally okay with us! But it did make me sad only because I know all the amazing pros of sharing a first look. However, a few months ago they let me know I had convinced them with our other pictures and blogs and they now wanted to share a first look! We were ecstatic for them!! As photographers we know that a first look means tonssss of gorgeous, dreamy portraits which is a HUGE bonus. But as a married couple, we also know what a first look provides emotionally as well. 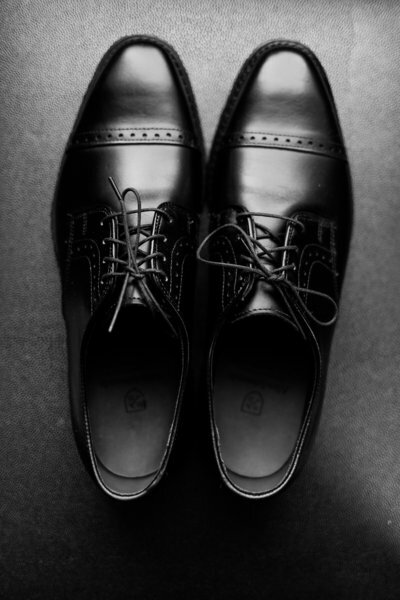 It gives our couples some alone time of their wedding day, just the two of them spending some quality time together. Personal space to feel any emotions they feel, space and time to soak in the day together privately. I could go on and on. I know Gabby & Kevin adored their first look, and I ‘think’ they will love the portraits they get because of it too, SO gorgeous and dreamy!! 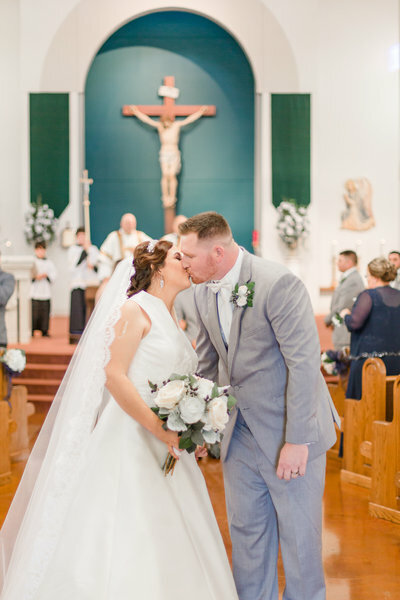 Gabby & Kevin were surrounded by so much love on their wedding day, from their bridal party, to family, and friends as well! 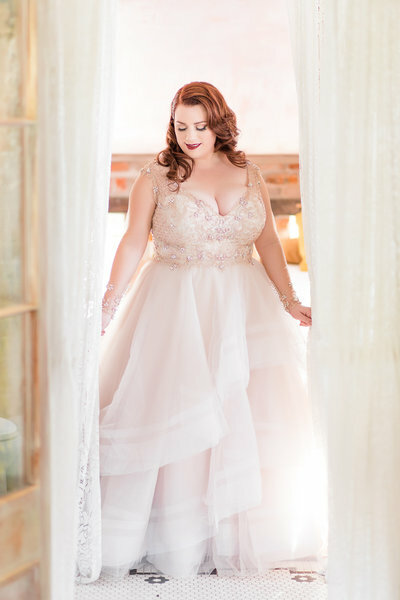 Her girlfriends made sure the entire morning was a celebration for their sweet bride, Gabby looked like a dream all dressed up in her gown and they made sure she knew it! It’s no secret that the color blush is basically my favorite thing…like ever. BUT her choice of French Blue is really making me question that! I immediately fell in love with her colors, all the gorgeous details and her florals! It makes me wonder…is blue the new pink?? Who knows!! All I know is that I seriously love BOTH now! 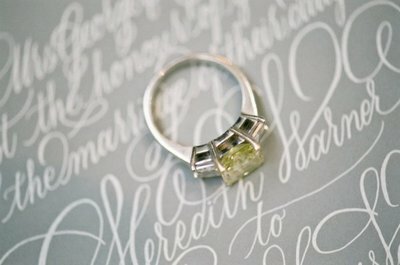 My favorite part of any wedding day is always the first look, it just makes me giddy thinking about it honestly! 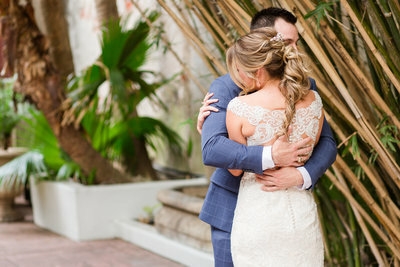 The anticipation, the emotions, the tears, the smiles, the hugs…it’s just perfection! 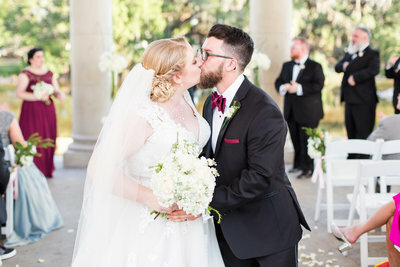 Gabby & Kevin shared the sweetest first look, Kevin was SPEECHLESS at how gorgeous his bride was!! We all were! Their entire bridal party was a last to hang out with and certainly made portrait time a breeze…these guys were *basically* professional level! I’m serious! 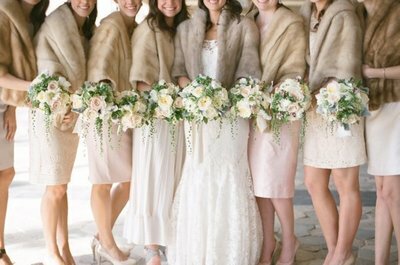 If ever there was an award for ‘best bridal party’…I think they could win!! You KNOW you’re living your dream job when your night as a photographer ends with hugs and kisses with the bride and groom…but ALSO with some bridesmaids! The best feeling ever! The night ended with every person on the dance floor, and if I’m being honest here I have to say…those were some of the best dance moves we’ve seen in a LONG time! The dance floor was packed, but for good reasons! The band kept the party going and everyone danced the night away too! All in all, it was the perfect night for the perfect couple! Gabby & Kevin, thank you for allowing us to be a small part in this special time in your life! It was such an honor for us! You two are honestly two of the sweetest and kindest people around. We have loved getting to know you both and it was an honor for us to witness you become husband & wife! Your special day was such a dream for us to be a part of, and your kindness and trust towards us warms our hearts. It’s incredible couples like you that make this ‘job’ so rewarding and special, and that’s something we don’t take lightly! I know you’re both enjoying the tropical breeze on your cruise right now, but we send tons of love and congratulations your way! 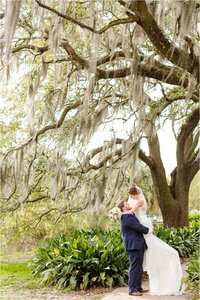 As you scroll through this blog, we hope you enjoy some of our favorites from this spectacular day!